Each group of volunteers for a given monthly lunch or dinner chooses a menu, and each member of the group chooses an item to provide on a consistent basis. Providing the food for the meal is a group effort. Group members participate in the meal in different ways. 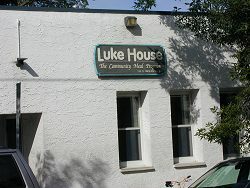 Some people provide food and then come to Luke House to prepare, serve and share the meal. Others participate by regularly providing their meal item. They may come to Luke House occasionally, seldom or never, but they play a key part in this ministry of hospitality nonetheless. Volunteers commit to a level of participation and to providing consistently what they can comfortably afford to supply. As we enter 2019 the Luke House needs the usual items: food, wearable warmth, cleaning supplies, toilet tissue, bus tickets, stamps and Ice Melt for sidewalks. We have perennial needs … and if you are looking for a way to make a difference … often time’s its beneficial to do what you do best. There are ways to bring “you” to the Community Meal Program without you even being there. The Meal Program can be a simple extension of your family’s table. Join with a group and make your meal part of ours. One such volunteer makes our meatloaf. Each time she slices a piece for herself and although she is not with us for dinner, she sits in her kitchen and eats her piece … and truly we are joined. The meal program has become an extension of her family’s table. Another spends time helping with communications needs which can all be accomplished from remote. How we all use our resources to make a difference can be as individual as you. It can be simple, you don’t even know how to cook. Serving the Community Meal Program can be a way of living out your faith and life sharing what you do best, your talents, your resources, and what is simply you. Rice, instant mashed potatoes, uncooked pasta & noodles, large cans of veggies & fruit, prepared meals, condiments, cooking oil spray. Gifts of new clothing, hats, gloves, scarves. Bleach, laundry soap, dish washing soap. Toilet tissue, bus tickets, stamps, Ice Melt for sidewalks. Pray for the Community Meal Program at the Luke House, for the people who gather here to share meals and for the ministry of hospitality.